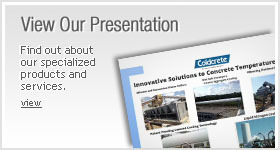 With successful projects around the world and technology that saves our clients valuable time and capital, Coldcrete has remained an industry leader in concrete cooling for decades. Coldcrete specializes in cost-effective concrete temperature control. 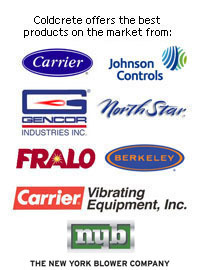 We offer a variety of products whether you are a ready mixer in need of chilled mix water or a general contractor in need of a custom cooling or heating system. Coldcrete can meet your specific needs. Coldcrete provides engineering and design for equipment such as ice plants, sand coolers, flooded wet belts, air handling units, cement coolers and even simple mix water chillers. We supply coarse aggregate cooling with chilled air and nitrogen systems as well as other coarse aggregate and post-cooling systems. With our wide variety of applications and equipment we can meet any concrete temperature specification, even 45°F (7.2°C) and lower. Coldcrete offers chilling and heating systems that are available in both permanent and portable configurations.